From its inception, America has been fueled by honor and self-sacrifice. A nation of brave idealists with an unquenchable thirst for freedom, and more importantly, the resolute willingness to fight for a better tomorrow. No matter which side of the political spectrum you land on, it’s hard to feel anything other than respect for those risking it all to ensure the embers of liberty burn bright. Nonetheless, respect alone doesn’t pay the bills. Imagine leaving your home and loved ones, going toe to toe with the darkest elements of human nature, and then returning to angry calls from debt collectors. This, unfortunately, is the tragic reality faced by far too many veterans with disabilities. Praise and adulation, you see, are meaningless if the leaders of commerce don’t put their money where their mouth is. In light of this, here are five tips for giving veterans with disabilities a warm welcome back to the work force. 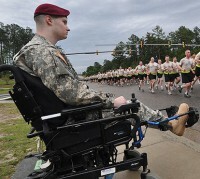 Our nation’s wounded warriors do not want pity. They do not want to be coddled or treated as victims. In truth, all they desire is a chance to excel. For this reason, it’s essential that you focus on individual merit. After all, you’ll be hard pressed to find employees with more discipline and focus. This assertion is backed up by hard data, not just warm sentiment. In fact, studies dating all the way back to 1948 consistently demonstrate the enhanced work ethic and productivity of former service members. CACI International, a large IT company, is just one of many businesses routinely tapping into this vast potential. Since 2007, they have prioritized hiring wounded vets. During that time, over 357 have successfully taken on roles as graphic designers, administrative assistants and intelligence analysts. That said, corporations aren’t the only ones capable of utilizing the talent of our nation’s heroes. One of the biggest mistakes small businesses make is associating extensive costs with creating a disability-friendly work environment. Unfortunately, this misconception is why only a fraction of vets find employment at small to mid-size companies. Truth be told, in almost all cases employers come out ahead financially. For starters, the average accommodation costs under $600. Meanwhile, work opportunity tax credits typically amount to well over $4,000 annually. So aside from feeling good and earning a top-notch employee, there is plenty of financial incentive to train and hire these well-deserving patriots. Furthermore, ample third party resources are available to ease workplace transitions. For example, in the case of vets with spinal injuries, the PVA is willing to send (even fly) rehabilitation specialists to job sites absolutely free of charge. There are certain skills that just can’t be taught at a traditional university. Instead, they are acquired through practical, real life experiences. Keeping this in mind, it’s important not to dismiss vets for lack of a college degree. A 25-year-old service member, for instance, has more years leading personnel than many mid-level managers in their 30s. With this in mind, you are strongly encouraged to research how various military occupations translate into civilian roles. To assist in this endeavor, organizations like Hire Heroes USA will match you with vets possessing the skills you need. Sometimes. the most painful wounds are the ones that can’t be seen. They remain hidden, silently gnawing away at your emotions until a normal life seems unattainable. Thankfully, most service members afflicted with mental injuries are capable of leading productive, fulfilling lives. That is, if they’re given a chance to find structure and purpose. Tragically, widespread ignorance and bias often prevent this from happening. First off, spend a little time educating yourself about PTSD. Surrender concerns of an employee losing rationale or other absurd exaggerations of the condition. Contrary to popular belief, most people with PTSD rarely ever show symptoms in public. If something does trigger a flare up, the most common response is to leave the situation and take a few minutes to regain composure. In fact, most active duty service members with PTSD are still considered fit for combat. That fact alone should be enough to dispel most concerns. As we usher in a new year, our heads are filled with thoughts of the future. Will you get a new job? How about a promotion? Will I be able to support my family, not to mention of having the possibility of starting one. Whatever the case may be, a tremendous amount of gratitude is owed to those who sacrificed so much to ensure these opportunities exist. Do them, and the nation, a service by remembering this fact the next time you’re looking to fill a vacant position. Data security analyst by day, freelance writer by night. Raised by an English teacher, I learned the power of language at an early age. Words have the ability to inspire, persuade, teach and comfort. As a writer, I make it my mission to do all four. This topic does not get enough attention. Thank you so much!